Has it been a while since you've been to a church? Maybe that one time for that wedding? Or that baptism? Or maybe you came when you were a kid but haven't been in aaages? On the 3rd February we are having a Back 2 Church Sunday and we'd LOVE to welcome you back! Of course we are open every Sunday so you are always welcome. Come as you are. There is a place for you. Everyone is welcome! Come and Grab a coffee and relax while the kids play! Gates open at 6.30pm - movie starts when it is dark enough!! Come and join us this morning to celebrate the coming of Jesus with us. Jumping castle, pony rides, sausage sizzle, box maze, craft and much more!! Bring a blanket and join us in a night of fun and carol singing. Wet weather plan in place - come along even if it snows! Christianity Explored is a 4 week course that gives you time and space to think through who Jesus is and why it matters. Contact us to let us know you are interested. A great day for Kids in Kindy to Year 5! Monday 23rd July is a Pupil-Free day, one of those weird days that is kinda the last day of the holidays, but also the first day in the new term. $10 per person/$20 per family. Limited places - register early here! 1) It'll be a chance to celebrate the end of the holidays with something REALLY fun! 2) We know that some parents need to head back to work, and so need somewhere for their kids to be looked after for the day! Loads of Fun - Awesome Jesus, and learning stuff about God! Morning Tea, Lunch and Afternoon Tea are included. If your child has any dietary requirements, please let us know on the Registration Form. For further information, contact the Church Office on 4735 1001. We'd love to have you along for lunch and share with you a bit about what we're passionate about, and how you can find your place here at Emu Plains Anglican. A fun family movie night in the school holidays. All welcome! Enjoy 'Paddington 2' as well as popcorn, hot chocolate and other goodies from the pop-up movie kiosk. Bring your bean bags, pillows and blankets or lounge on ours in the comfort of our spacious auditorium. Friday July 13th. 6.30 pm. First week of the holidays. A night for women of all ages to come and enjoy some chocolate desserts in a relaxed setting. 3 generations of women will be sharing the story of their relationships with one another and how it was shaped by their common faith in God. $5 and RSVP to the office@epac.org by April 29. Deuteronomy is an ancient book but compellingly relevant. Come and join us on Sundays to meet the God who is totally devoted to his people. Come and be challenged by our series of talks from the book of Deuteronomy. See Sundays for more information about joining us for church. A fun family movie night in the school holidays. All welcome! Enjoy popcorn, hot chocolate and other goodies from the pop-up movie kiosk. Bring your bean bags, pillows and blankets or lounge on ours in the comfort of our spacious auditorium. Friday April 27th. Second week of the holidays. Join us over the next two weeks when we look at more 'wisdom for life' from the book of Proverbs. See Sundays for more information about joining us for church. Come and celebrate with us! Good Friday followed by morning tea. Easter Sunday celebration followed by brunch after 9.30 church and supper after 6.30 Church. Love to see you there. Do Christians Still Believe That? A great fun day for Primary School students on the first Pupil-Free day of the year! Have a BLAST making and launching your very own water-powered rockets! 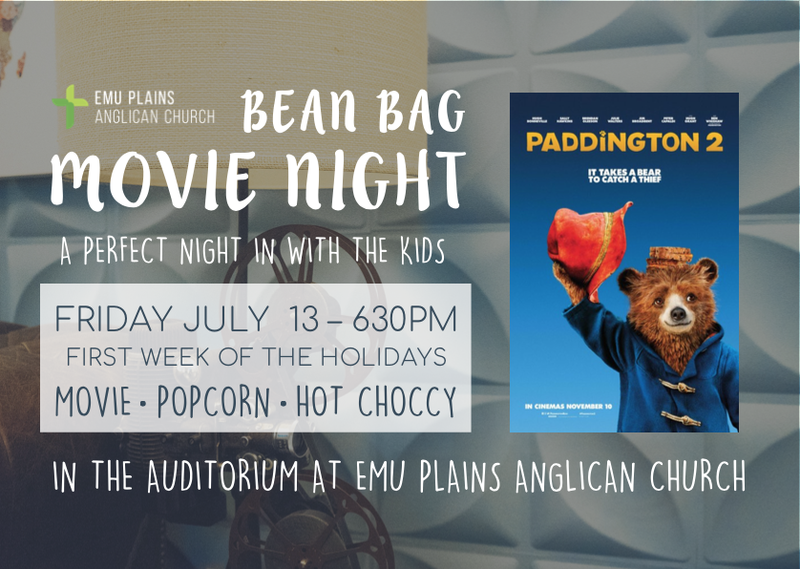 Free outdoor cinema in Emu Plains, showing the hit family movie Sing! Celebrate Jesus' birth with a fun-filled family church service! Celebrate the birth of Jesus with a traditional church service at 8am. Every year on Christmas Eve hundreds of Emu-Leonay locals get together at Emu Plains Anglican Church for a fun, festive, joy-filled time celebrating Christmas and the good news about Jesus. Come and celebrate Christmas with a party under the trees! Topic: Christmas - Fact vs Fiction! Come and enjoy a great night out at O'Donoghues Irish Pub! Come for dinner, then head upstairs at 8pm for a talk about Christmas - Fact vs Fiction. Running during our 8am, 9:30am and 6:30pm regular church services. When it comes to Christmas, how do you separate the facts from the made-up stories? This talk will think about whether the Bible's story really stacks up.